Fred Robertson, like his more famous older sister, Anna Mary Robertson (Grandma) Moses, was born on a farm north of Albany, New York, and grew up in relative poverty. While attending the district school, he earned extra money as a farm hand. Without the benefit of high school, he managed at the age of twenty-three to enter and then graduate from Cornell Agricultural College. He taught school for a time, but in 1920 he bought a 300-acre farm in Savannah, New York, producing wheat, dairy and truck products. 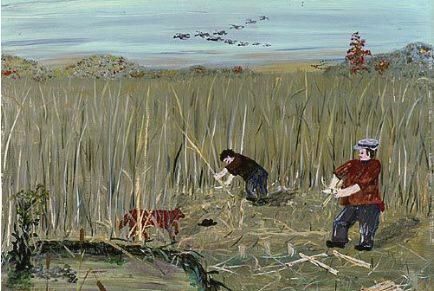 Around 1943, when his two sons began helping him work the farm, he had more free time and, encouraged by his sister, Robertson tried his hand at painting. This activity, which he began as a hobby, turned into a passion, and for the rest of his life he devoted many hours to his art. While Robertson had picked up some technical tips from his sister--using fairly dry oil paint on boards rather than canvas--his style differed greatly from hers. His brush strokes were stronger and bolder, his palette more somber, his subject matter less lyrical. In the landscapes, he documented life on the farm in a matter-of-fact manner, depicting many of the old-time vehicles and customs. He completed about two hundred paintings. Robertson had a one-man show at Galerie St. Etienne in 1945, which generated much interest and critical success. Subsequently, his works were included in group shows in New York and nationwide.